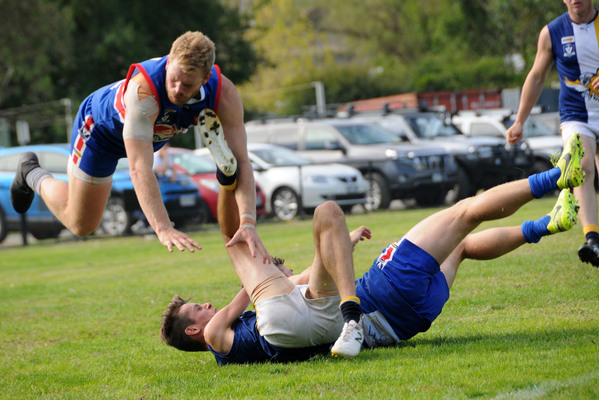 Ruckmen Conor Cunningham and Duncan Proud soared for this contest. For the Korumburra-Bena senior side, this isn’t so much a rebuilding season – it’s a building one. For Paul Alger’s Giants, it’s all about building towards an exciting, sustainable future – but on Saturday at The Showgrounds against the Warragul Industrials, the group showed there’s plenty to be excited about in the present as well. In a hard-fought clash all day, the home side prevailed by just two goals in stirring scenes, 13.3 (81) to 10.9 (69). Jamie Cann slotted four majors for the Giants, while Josh Hill, Brad Monson, Bailey Patterson and Ben Fitzpatrick were all influential standouts. Alger – a premiership coach many times over – spoke to the Gazette following his first win back in charge of one of his old clubs, Korumburra. He spoke about just how young and inexperienced this group truly is. “I think we had 16 kids under 20 play on Saturday,” he estimated, pointing to the genuine excitement at the result. “The rooms were full after the game, and that was great because it’s really important to celebrate every win. Alger saw it as a positive that his side played against reigning premier Phillip Island in Round 2, despite the eventual losing margin. “It’s good that we played the Island early because we know we have to build ourselves up,” he explained. Make no mistake about it, the Giants knew – just like the Dusties – how winnable the weekend’s game was. Looking back on the clash, Alger said the Industrials should have been in front at three-quarter time after his side got about three straight kicks in front before easing off. “They had the slight breeze in the last quarter, and in the end I was really happy with the way our boys fought it out,” he said of the victory. Impressively, when the Giants were challenged, some of their young charges really stood tall. Alger spoke of Hill taking a series of telling contested grabs right in front of the grandstand, a particularly impressive feat for a player so small in stature. The Giants effectively lost their entire starting spine in the off-season, and three players walked out the door just two days before Round 1. But Alger, and his group, are moving on – with a group committed to the cause. It starts with him. 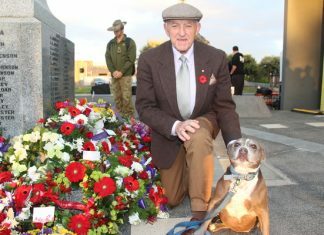 As a sign of just how young his group is, he estimated that he not only played footy with the fathers of some of his players, but also grandfathers. 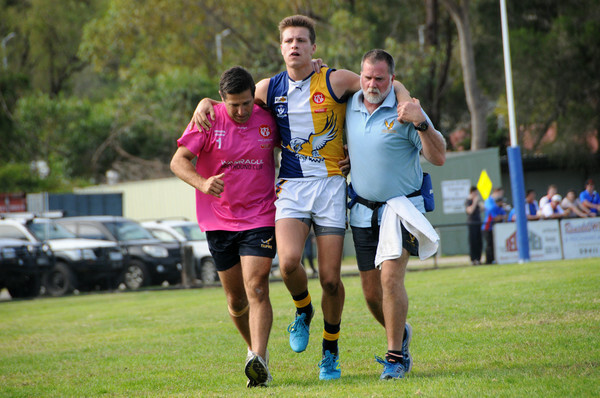 Meanwhile, at Bunyip, Inverloch Kongwak continued its winning start to the season despite adding to its already telling injury list. Xavier Hughes went down in the first half, adding to a casualty list that already includes the likes of Josh Purcell, Andy Soumilas, Adam Cross, Daniel Reid, and Corey Casey among others. By the end of the game, they would hardly have had 18 fit players. The Sea Eagles started strongly on Saturday, booting six goals to one in the first term, but the Bulldogs pegged the deficit back in the second and – by coach Tom McQualter’s own admission – the half-time break couldn’t have come at a better time. His group was getting soundly beaten at the clearances, and he called for composure and unselfishness throughout the second half. And that’s exactly what his players responded with as they ultimately won 16.5 (101) to 9.12 (66). Pointing to the Sea Eagles’ remarkable accuracy, at one stage in the third term they had 12.2 on the board – with both of those minor scores coming via posters. 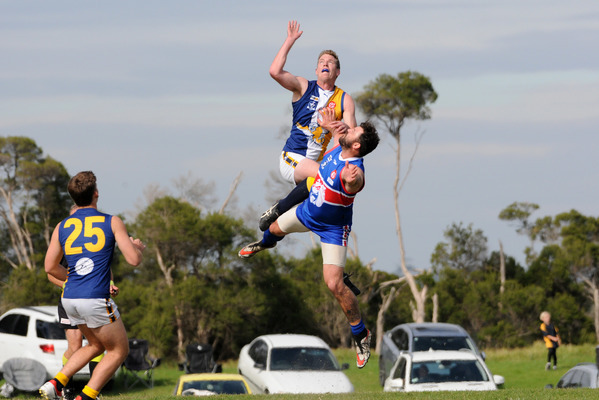 At three-quarter time, with his side down 31 points, Bunyip co-coach Aussie Jones called for his players to have the courage to stick to their guns. While they lost by 35 points in the end, there were still plenty of positive signs to emerge out of the clash for the home side. Duncan Proud was superb in the ruck in the absence of Chris Kelf, while Will Papley, Jeb McLeod, Rickie Crockett, and Brad Walker refused to take a backwards step. Lachie Scott, Dylan Clark and Jack Hutchinson were outstanding, meanwhile, for the Sea Eagles in a performance where they showcased the size advantage inside 50 courtesy of three goals to Sam Gibbins and two to Cam Roughead. 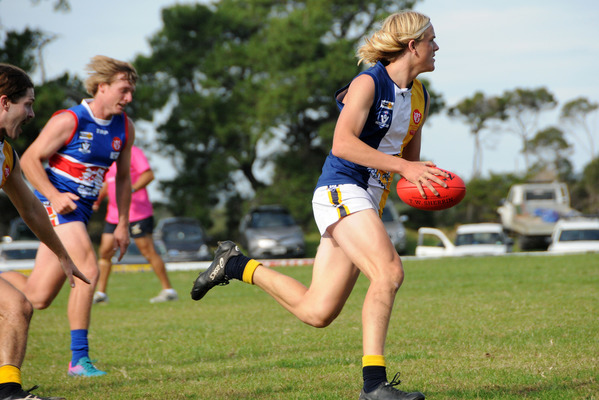 In the other games across Round 3, an eight-goal haul from Andrew Dean saw the Seagulls annihilate the Panthers at Bass to the tune of 128 points, 23.15 (153) to 3.7 (25); while nine combined goals from Troy McDermott (five) and Lachy Hansen (four) – in addition to a starring role from Trent Armour – led the Goon to a resounding win over the Magpies at Dalyston, 15.11 (101) to 4.12 (36); and Phillip Island proved far too good for Garfield at Cowes, 11.17 (83) to 4.5 (29).